Pool fence installation can be a lucrative business. However, sometimes it can feel overwhelming to start without the proper tools or business supplies. That is why we’ve created this starter kit with everything you’ll need to help jumpstart your business venture. 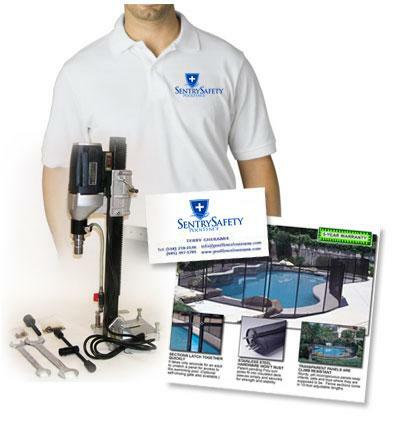 It stars with the core drill: an essential installer’s tool which enables efficient installation of Sentry Safety’s Classic Guard Pool Fence. A help guide and access to our support through a special phone number combine to help make your business run smoothly. Additionally, you will receive specially designed business cards with your name and contact info, and traditional professionally designed A4 styled flyers. You can distribute these flyers to local pool stores, churches, community functions, grocery store bulletins or anywhere else your potential clients visit on a frequent basis. Each of the tools and supplies provided in this kit will help you to easily form and run your professional pool installation business. Many individuals dream of working for themselves on a schedule that fits their lifestyle. Now, you can be your own boss backed by a quality brand product line and professional support team.